The Omicron RT5 series is a grinding machine that is composed of base, table, workhead and among others. In base, the lubrication plant provides oil to the guides by means of a constant oil flow distributed on the complete length. While in the table, lubrication is assured by a constant oil flow distributed over the complete table length. In workhead, the structure in stabilised and well ribbed cast iron allows to support the workpiece weight. It is equipped with fixed and turnable spindle. The wheelhead's structure is composed of two carriages in normalised cast iron. Hydrodynamic type rotates on anti-friction metal bushes, which guarantees an high finish degree. 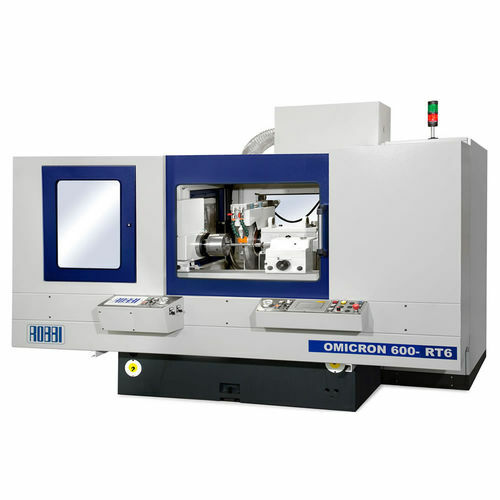 The Omicron RT5 series has its maximum distance between centers of 600 mm up to 1000 mm.